New realities are being shaped in Sudan following the military coup that toppled President Omar al-Bashir, which threatens to disturb the balance in the region. On Sudan’s Suakin Island, Turkey aims to ensure stability in the region through its “peace triangle” through its bases Qatar and Somalia, as the military base that is set to be built there will serve as a cornerstone for peace in Sudan, in parallel with Ankara’s efforts to elevate its current diplomatic ties to Khartoum and boost its investment activities in the African country. “For now it appears the current administration wants to pursue a peaceful approach. This must not be allowed to be sabotaged. Turkey must engage in active diplomacy in that regard,” experts told Yeni Şafak daily, as they voiced cautious optimism about the future stability of Sudan. 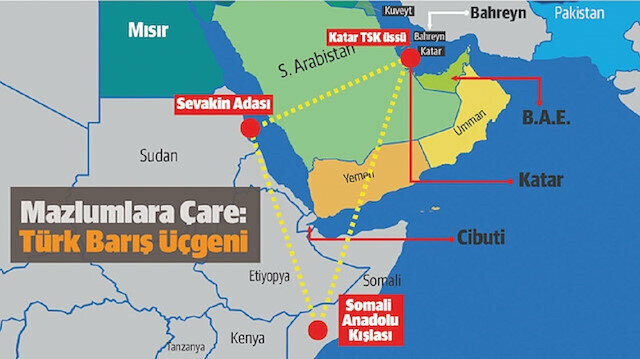 The status of Turkey’s investments in Sudan following the military coup became a topic of interest over the past week, as Ankara continues work on the leased Suakin Island, which is expected to give Sudan’s economy a great boost after the rehabilitation of the island’s port on the Red Sea is complete. Upon the completion of Turkey’s military base in Suakin, it is expected to serve as a beacon of peace along with Ankara’s other bases in Qatar, securing the area spanning Africa and the Gulf and promoting peace in the Mediterranean, the Red Sea-- and even the Indian Ocean. In a bid to transform the island into a cultural and tourism hub, the Turkish Cooperation and Coordination Agency (TIKA) had restored Suakin's 200-year-old Markaz (central) Administration building, Ali Ahmad Hamid, the governor of the Red Sea Province in eastern Sudan, said. He added that the reconstruction of the Customs Area in the ancient heart of the island was about to be completed.